What is the Vertimax used for? The Vertimax offers elite performance gains for performance clinic use targeting the vertical jump, acceleration, top-end speed, and sport specific movement. Vertimax has shown to be the most effective piece of equipment to quickly develop sport specific acceleration abilities for sprint events and lower body reactive power for field events requiring explosive movements. I have had great success with the Vertimax V8 with my baseball athletes of all ages in gaining the necessary acceleration speed that they need for base running. In baseball quick acceleration bursts to go from base to base is very important for a base runner to beat out a throw. The initial 10 yards of acceleration is the most crucial when creating speed necessary for a successful stolen base or when scoring a run. 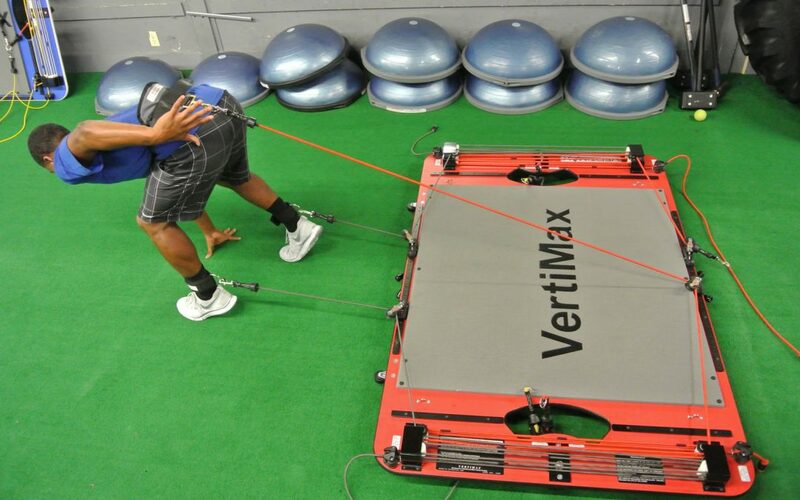 The Vertimax has a continuous resistance that allows a runner to work on that initial 10 yard quick burst. The Vertimax allows the base runner to accelerate with proper form and not having any change of resistance which can deviate their running posture. The Vertimax V8 has been a great tool in our performance clinic in gaining quickness in our baseball position players. Quickness and reaction is important for infielders when fielding a ground ball or line drive. Quickness is also necessary for an outfielder who needs to react quick to a pop fly. The Vertimax is very versatile when working on quick reaction and change of direction drills. I have had great success in using the Vertimax waist belt and ankle resistance attachments when doing side to side, forward/back, and transverse plain movements. For instance, I do a fielding drill with my infielders where I have them field a ball that is rolled to a certain direction and they have to quickly react to the ball while the Vertimax provides continuous resistance through their legs and core on a sagitall plane. I can also work on fielding laterally side to side to influence hip strength involvement which many baseball players lack. These drills not only work on the necessary movements in the sport of baseball but also provide an extreme workout for any athlete.